Got started in radio in my basement. A friend that was into electronics built me a little transmitter that ended up reaching several miles. It quickly fried up before the FCC found out! Worked at the University of Toledo radio station doing a Christian music show until I got my first real job at then mainstream CHR WRQN. Started doing overnights and weekends then quickly became production director and evening host and eventually to middays. Next became Production Assistant and eventually Production Director and fill-in announcer at AOR Powerhouse WIOT for 7 years. Nine months after YES-FM went on the air I went on board as Production Director and weekend announcer and after a couple of years Program Director and Afternoon Drive host. 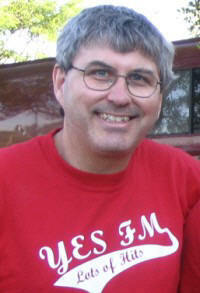 Have been at YES-FM for 15 years. My other passions are travel and meteorology. I am a weather hobbyist and Skywarn Spotter that has spotted tornados on radar before the National Weather Service! Of course, I love my wife, four kids and grand-daughter! Want to see pictures?! I see so often with Christian businesses that their business practices are sub-par in quality and professionalism. I strive to make us sound as good or better than any other station on the dial and all that we do is professional and represents Christ with excellence. Our competition is different. It used to be the other radio stations. Now, it still is to an extent, but more so all the electronic media out there, especially I-Pods and the internet. The quality of music is better, especially in the last 10 years. Overall, Christian radio has learned a lot on how to compete with and sound as good as secular stations. Today’s Christian radio PD needs to be internet savvy and up on frequently changing consumer technologies, and always keeping up on listener interests. He or she must be able to inspire the staff and encourage them to keep up with trends. I look for songs that, of course, fit our unique rock/CHR blend format. Songs that stand out and make you go wow! What a great song! If it sounds like music one would expect from a Christian radio station, we probably won’t play it. We are losing the younger generations both to radio and to Christianity. We’ve got to get their attention! They say only four percent of this current younger generation are strong Bible believing committed Christians. If we don’t try to reach them better, that number will shrink! Promotions that connect with the listeners or gets them involved. I see so often when people go to a concert and the artist connects with the audience both on and off stage, they have gained loyal fans. We need to do that with radio. Also, on-air promotions that get the listeners thinking or get their opinions have worked well. Get to know each station and it’s format. I know there are a lot of stations out there but not all stations are alike in each format. We really need to re-evaluate the current process of single releases and focus on spin charts. I feel it does not serve the consumer, it serves the industry. Especially in the rock format, people can hear new music from their favorite artist online, and at band myspaces and buy songs online well before we ever get a single serviced to us. Getting the attention of the public to get them tuned in and away from all the new technologies and choices and get their attention from all the busyness in their lives. Keep it brief and engage the listener. That takes creativity and personality. I’ve heard some say, how can we have personality without the option to talk a lot? Anyone can talk. It takes personality and creativity to be entertaining and to say something in a concise manner. Also, there is a phrase I always remind our jocks, It’s not about you! Radio U and Way-FM Grand Rapids. They are always on the cutting edge and are in tune with their listeners tastes and needs. What I do NOT see are many stations going after the younger audience. It is too much of a challenge and it will require radical changes. Overall it will continue to cater to women 25 plus. The innovators will still be around. The others, well, I’m not sure!